In the year since NorthBay Healthcare became a member of the Mayo Clinic Care Network, urologist Herkanwal Khaira, M.D., has seen firsthand how the collaboration is providing peace of mind and strengthening his doctor-patient relationships. 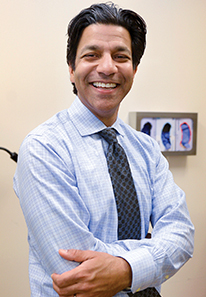 “If I have a patient and I tell him ‘You have prostate cancer and your treatment options are this, this and this,’ and they are struggling to make a decision, having another opinion that suggests the same process makes them much more comfortable to proceed,” said Dr. Khaira. When the collaboration with Mayo Clinic was announced last year, NorthBay Healthcare became the first hospital in Northern California to become part of the network, which now includes more than 40 health care organizations across the country and around the world. The relationship with Mayo Clinic gives NorthBay physicians access to more than 4,000 physicians and scientists for second opinions, another set of eyes or simply to weigh in on complex cases. This sharing of information and treatment options comes through the eConsult process, an electronic method for a Mayo Clinic specialist to answer a physician’s focused question about diagnosis, therapy or management through a review of the patient’s electronic medical record, imaging studies and laboratory tests. In the first year of the collaboration, 24 NorthBay physicians across 13 specialties submitted 122 eConsults. Dr. Khaira submitted 14 eConsults, second only to oncologist James Long, M.D., NorthBay’s physician champion for the collaboration since its inception, who submitted 23. Dr. Khaira used the eConsults and Mayo Clinic information in multiple cases including complex diagnoses like kidney cancer and in situations involving uncommon diagnoses, he said. With eConsults, NorthBay doctors submit the patient’s information and test results and the experts at Mayo Clinic review and advise without the patient having to travel out of the area. And the Mayo Clinic reviews can often include information about clinical trials and studies that the doctor may not know about. Nine NorthBay Healthcare employees traveled to Mayo Clinic in April to learn cutting-edge strategies for the care of patients with Chronic Obstructive Pulmonary Disease (COPD). They spent three days with Mayo Clinic’s COPD team and other members of the Mayo Clinic Care Network learning how to incorporate Mayo Clinic’s successful treatments into NorthBay’s practice. Mayo Clinic’s COPD Hospital Readmission Reduction Collaborative was an opportunity for NorthBay staff to participate in training sessions at the flagship hospital in Rochester, Minnesota. “We spent our time learning about Mayo Clinic’s COPD process, what they’ve learned about the disease, and how we can incorporate their successes into our own program,” explained Mike Farley, COPD educator.